Getty Copper is a Canadian mineral exploration and development company committed to increasing shareholder value by continued exploration of the many extensive Induced Polarization (I.P.) anomalies on its Highland Valley property, continual growth through exploration, discovery and development of new base metal or gold deposits; and acquisition of producing or advanced exploration stage mineral properties. Getty Copper plans to continue implementing a growth strategy. 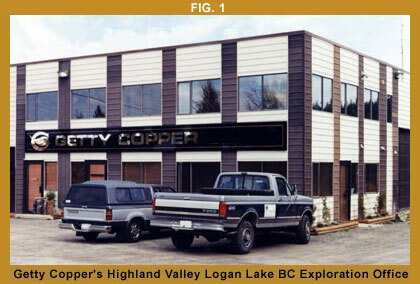 Getty Copper’s main objective is to place in production its Highland Valley open-pittable porphyry copper deposits. In addition to advancing the Highland Valley Project, Getty Copper is also continually evaluating other mineral exploration and development projects in Canada and worldwide. We are confident that in the years ahead Getty Copper will reach its objective of enhancing shareholder value. Certain statements in this document constitute “forward-looking statements” within the meaning of the United States Private Securities Litigation Reform Act of 1995. Such forward-looking statements involve known and unknown risks, uncertainties and other factors which may cause the actual results, performance or achievements of the Company, or industry results, to be materially different from any future results, performance, or achievements expressed or implied by such forward-looking statements.